LONDON BADGERS FEATURED IN "THE LONDONER"
Already recognized across the province and many parts of Canada as one of the premier baseball programs in the country, the London Badgers are taking great strides to grow and continue their prominence in the game. When the Badger program was first launched by the London District Baseball Association (LDBA) in 1994, the numbers of kids playing the game were at all-time highs, the Toronto Blue Jays had just won back-to-back World Series championships and interest in the game of baseball was high. Over the next 15 years starting with the Major League Baseball strike in 1994, interest in baseball and the number of kids playing the game sank. With the Blue Jays seemingly moving back into contention and the number of players registered for baseball particularly at the youngest age groups growing and approaching the numbers seen in the early 1990s the Badgers are hoping to begin embarking on a plan of growth. It is the goal of the London Badger program to promote grassroots baseball in the London area. One program that has met with success is called, Hit With The Badgers. Badger head coach Mike Lumley explains the free hitting clinics as a day of fun and baseball instruction. You wouldn’t have known it was as chilly as it was by watching the young players go through warm-ups and hitting drills and then play a scrimmage against the Minor Midget Badgers before their weekly doubleheader. Besides gaining awareness in the Badger program and helping to promote development of young baseball players, the organization is hoping its growth plan over the next three years will culminate with teams at every age group from minor mosquito to major midget and everything in between. Besides that, thanks to an affiliation agreement struck last year between the Badger midget team and the St. Thomas Tomcats of the Junior Intercounty Baseball League and a similar agreement between the Tomcats and the London Majors there will be a link of elite baseball from top-to-bottom in the London area. Mike says adding a minor mosquito team this season will help with overall player development. The free hitting clinics which are open to all London area baseball players aged 8-12, will continue for the next few weeks. ¦ Anyone interested in knowing more about the London Badgers or becoming involved in the Hit With The Badgers program can visit www.londonbadgers.on.ca. Former London Badgers players Adam Stern and Chris Robinson played important roles in Team Canada's strong showing at the recently played Final Olympic Qualifying Tournament in Taiwan. Canada finished in first place with a record of six wins and a single loss to Australia in the qualifying tournament that took place in Taichung, Taiwan March 7 to March 14. After joining their respective Major League teams for Spring Training and their professional seasons, Team Canada will reunite for the Beijing Olympic Games which are scheduled to go from August 8 to August 24. After pounding out an opening win over Mexico 15-10, Team Canada mercied South Africa 10-0 behind a strong pitching performance by Brett Gray of Petrolia, Ontario and a strong hitting performance from catcher Chris Robinson of Dorchester, Ontario. The mercy ended in the seventh inning with a walk-off home run by Robinson who went 4 for 4 in the game. "It has been a while since I have done that." said Robinson with a laugh of his 4-for-4 performance with a double, the homer and two RBI. "We came into this game with a must win attitude. We handled ourselves well against a scrappy team and we knew that coming in and we were ready for them and we really battled." After dropping their third game to Australia 10-5 Canada came up with a big win against Chinese Taipei by a score of 6-5 in 10 innings. Londoner Adam Stern, who was Canada's centre fielder and lead-off hitter throughout the tournament, scored an important run that tied the score at 2-2 in the third inning after Chinese Taipei had jumped out to a 2-0 lead. "This will go down as one of the greatest games I have ever been involved in with Team Canada." said Manager Terry Puhl. "There are so many heroes on this team tonight, just one after another you can name them." In their next game Canada used five runs in the third inning and four runs in the fourth inning on their way to an easy 11-0 victory over Spain in seven innings. Adam Stern started off the four-run fourth inning with a single. Canada guaranteed themselves a berth in the Summer Olympics with a 4-3 win over Korea in their next game and then finished off the tournament clinching first place with a 2-1 victory over Germany in 10 innings. The Team Canada goal, when they went to Taiwan, was to secure a spot in the Summer Olympics. They did just that, and they did it in fine fashion. Now we all have something to look forward to as our native sons prove to the International baseball world that Canada is a major player Internationally. Good Luck Adam and Chris. Bring home the GOLD! The London Badgers organization was featured in this week's 'The Londoner'. The full story is posted on the 'Badgers' page of the website. You can also visit www.londonbadgers.on.ca for more information on the Badgers and their programs. The London Midget Badgers are coming home with GOLD! The London Midget Badgers representing Ontario defeated Quebec by a 7-1 score on Sunday night in Fredericton New Brunswick to capture the Baseball Canada Midget Championships. The win over Quebec completed a perfect tournament record of six wins without a loss. Left-handed pitcher Ryan Zimmer picked up the win. He pitched five strong innings allowing only one run on three hits while striking out nine. Baird Kelly came on in relief of Zimmer in the sixth inning and picked up the save, recording three strikeouts while allowing only one hit. Offensively, the Badgers were led by Baird Kelly who went 3-for-3 at the plate. Andrew Firth and Ryan Zimmer each had a pair of hits while Trevor Barton, .Cole Stewardson and Paul Lytwynec had one hit each. The Midget Badgers won the Canadian Championship in 2001. 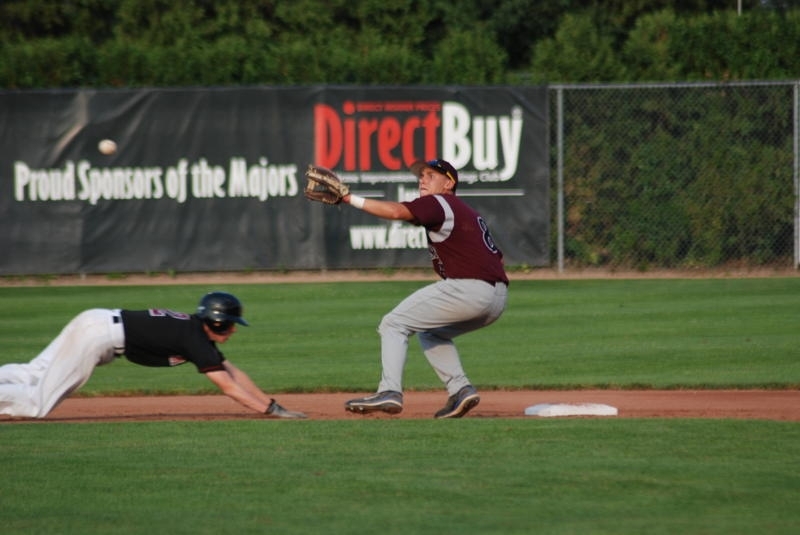 The Baseball Canada Midget Championships were a huge success both on and off the playing field. For the second consecutive year the London Badgers captured a medal at the Midget Nationals. Although they won bronze and didn't duplicate last year's Gold Medal winning performance the entire event was a huge success and will have people from across the country talking about it for years to come. Baseball Canada official Tom Valcke had words of praise for the organizers of the event, "It is one thing to coach a top-notch, nationally-respected baseball team. It is another to govern an organization with the size and scope of the London Badgers. It is yet another to run a National Championship baseball tournament. To run all three simultaneously, and with the success that Mike and Cindy Lumley pulled off this weekend, is incredible." Valcke continued his praise of the volunteers, "The quantity and quality of volunteers that London provided to slam dunk this championship, proved yet again that this city is capable of hosting anything. I even mean an international championship, with first class professionalism while maintaining ‘true Canadiana wholesomeness.’ Add to this the three fields that were utilized, and the support provided by the city crews in London and St. Thomas, and you have the recipe for success." Gold medal winning coach Dave Cooper who has participated in 23 Baseball Canada National Championships as a player and coach had words of praise of his own, "We had a great experience here in London. The parks were top notch and the organization of the tournament was as good as and probably better than any I have been to." Cooper's Tecumseh Thunder representing Ontario won the Gold Medal by defeating Quebec by a 6-2 score while the London Badgers defeated British Columbia 5-2 to take the Bronze medal. Rob and Matt Skirving The Pirates have a new fan! 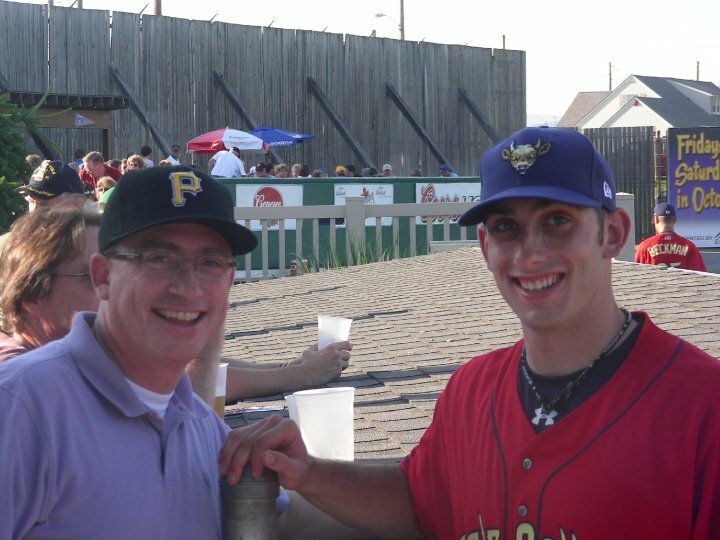 Matt Skirving who played Mosquito and Pee Wee for EBBA and Bantam for the London Badgers before moving with his family to Midland Michigan was drafted in the 30th round of the MLB Draft by the Pittsburgh Pirates on June 9. Matt who just completed his junior season at Eastern Michigan University signed a few days later with the Pirates and was assigned to the State College Spikes in the short-season Single-A New York-Penn League. Matt's father Rob Skirving was an LDBA vice-president in 2002 and 2003 before taking a job in Midland Michigan where Matt played high school baseball and then moved on to EMU Eagles where last season he hit a college career high 16 home runs.